A few weeks ago, at Lissmore Castle, I renewed my acquaintance with a plant I have not grown for a few years, Didiscus caerulea, sometimes known as trachymene. This native of Australia is obviously related to carrots and ammi and has typical, slightly domed heads of small flowers arranged in an umbel that makes it typical of the Apiaceae. What makes it special is the sky blue of the flowers, given away in the name by caerulea. Didiscus means two discs and refers to the seeds. It is a frost tender annual that is grown from seeds sown outside after the last frost in areas where the season is long but, in the UK and Ireland, should be sown in gentle heat in a propagator in March or April. I always find the plants a little tricky to grow and they are very prone to overwatering or cold, wet compost so if you have any reservations it is best to wait for April till you sow. It is worth adding perlite to the compost to give better drainage too. Like many of the family it has a reputation of disliking root disturbance so I think it is best to treat it as I treat zinnias and sow the seeds in cell trays, two seeds per cell, so they do not need any pricking out and can be planted straight from the cells into the garden in late May. They then need a warm, sunny spot in well drained soil. Despite the great beauty of the flowers, the plants are a bit of a different matter. The coarsely divided, bristly hairy leaves are nice enough in theory but in practice the sparsely branched plants are not so much slender as gawky and have a slightly inelegant habit. I think they are best planted in a decent sized drift, about 20cm apart and since they will grow to about 60cm high I would support them with pea sticks. 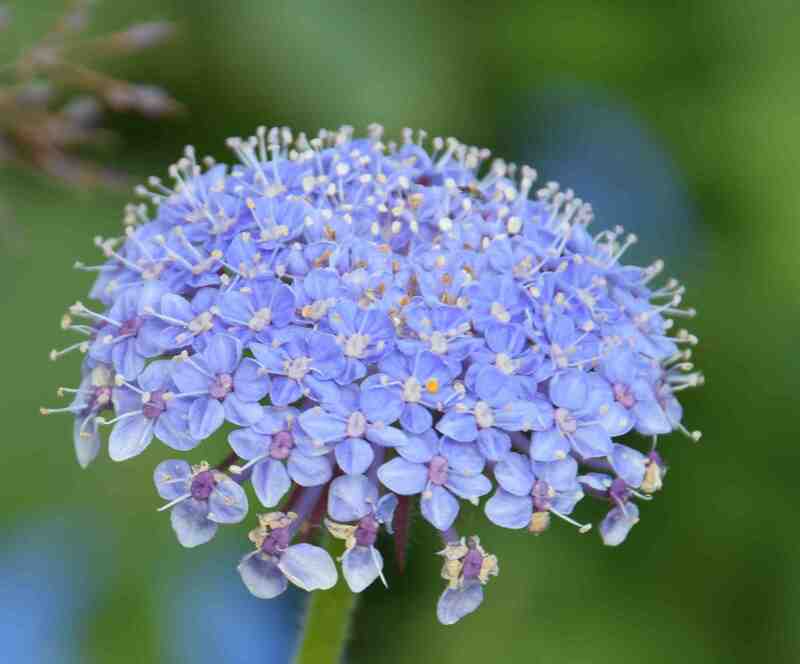 An alternative, which would look nicer, is to mix them with another annual but you need to find one that is also slender and won’t crowd the didiscus or the swamped stems and leaves will get grey mould and rot. 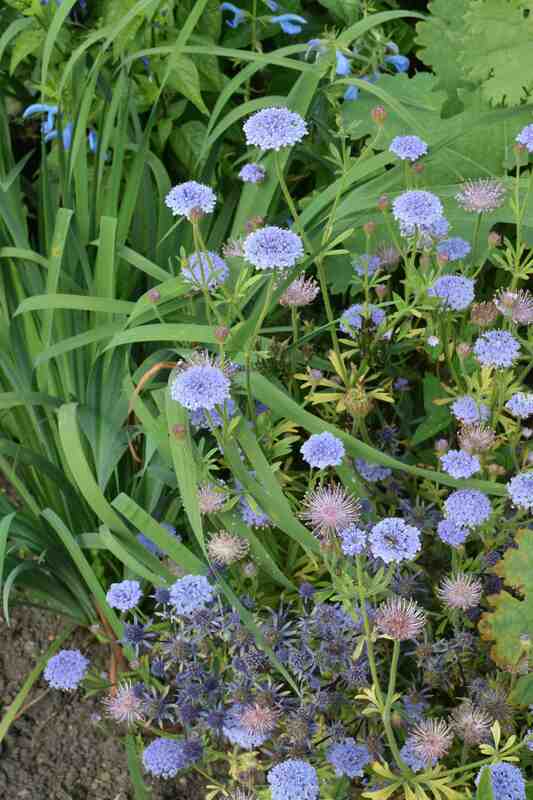 Here at Lissmore (below) they used pale blue Salvia patens and eryngium. If the soil (or the summer) is wet, the foliage will not be the attractive grey green but will become yellow and anaemic. In cool climates it is worth growing this in a greenhouse and it makes a good cut flower, lasting well in the vase and would make a nice complement for sweet peas. In addition to the standard blue there are white and pink forms (most commonly in the ‘Madonna’ mixture). Personally I can’t see the point of these, rather like pink and white scillas and chionodoxa – yes I know that chionodoxas ARE scillas now but to my mind they are distinct! Why go to the trouble of growing a plant that is famed for its blue shade and then grow a white one – rather like Plumbago auriculata – and the pink is a slightly grubby shade. – in the UK and Ireland. It’s certainly a lovely shade of blue.